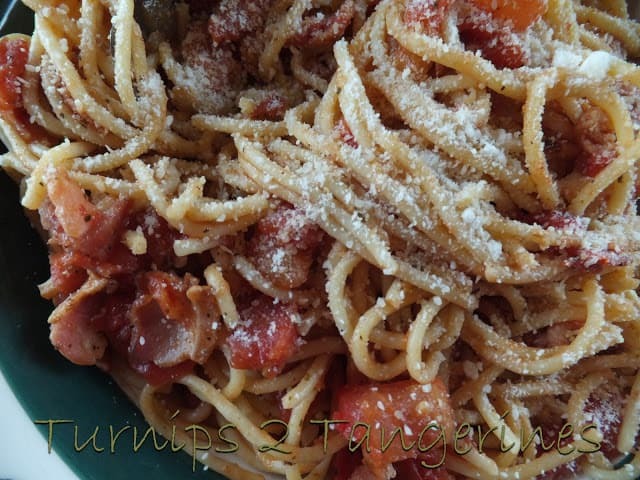 Bacon and Tomato Spaghetti is not only fast and easy to prepare, it’s also super delicious. It’s surprising how so few ingredients can be transformed into something so tasty and satisfying. It’s the perfect lunch, dinner or late night snack. I found this recipe on the Food Network website. I needed to bring something to a potluck and wanted to use the ingredients I already had on hand. The combination of ingredients is sensational. It was a hit! Needless to say, this spaghetti salad was a super huge hit at the potluck! My only regret was I didn’t bring copies of the recipe, but this recipe can be found on the Food Network Website. Once again Guy from “Guy’s Big Bite” has turned something so simple into something beyond delicious. Pasta never tasted so good! I’m sure the tomatoes, bacon, cheese and balsamic vinaigrette also had something to do with the delicious taste. 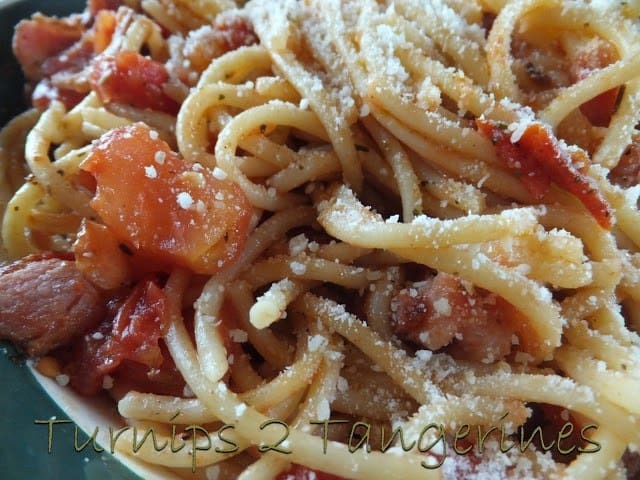 A delicious blend of ingredients make up this super pasta dish. Heat a large skillet over medium heat. Saute' bacon until crispy, about 10 minutes. Remove bacon and drain on paper towels. Remove all but about 2 tablespoons bacon grease from pan. Add onions and red pepper flakes to the skillet. Cook until onions are translucent, about 7 to 10 minutes. Add garlic and cook for about 2 minutes. Add tomatoes, balsamic vinaigrette, salt, pepper, Italian seasoning, and bacon to the skillet. Cook on low about 20 minutes to allow flavors to blend. 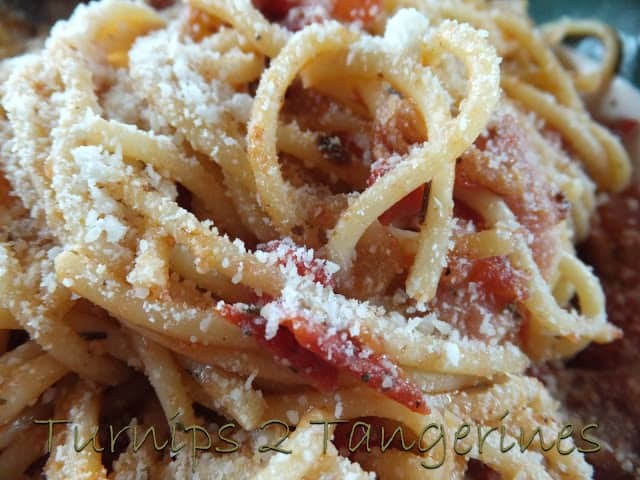 Toss with cooked spaghetti and shredded Parmesan cheese. If I put bacon in our spaghetti sauce my husband would think he died and went to heaven 🙂 I host a linky party on Tuesday called The Gathering Spot and would love it if you'd stop by and link up. Have a wonderful Sunday! I am so glad you enjoyed the Bacon and Tomato Spaghetti! I really think your suggested additions sound wonderful! So glad to have a fellow pasta and garlic lover 🙂 Have a wonderful weekend! What a cool idea to swap, try new recipes and meet new people. You are always so on top of what is going on out there Lynn. Hi Lynn. The spaghetti looks delicious, how fun to swap recipes! I just signed up for the Surprise Recipe Swap. I'm so excited and thanks for posting about this great opportunity!